I've been a little quiet on my site, but it's not for lack of writing! I've been making my way around the interwebs, and prepping for conference presentations, new opportunities, and writing where and when I can. 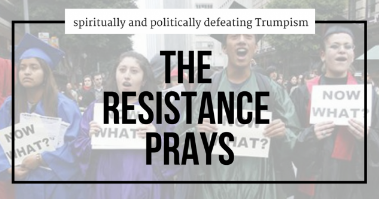 One new endeavor is a regular spot writing for The Resistance Prays. Started by a fellow alum of my seminary, these daily email newsletters focus on a piece of news and then give people biblical, prayerful ways to respond. My latest letter focuses on the impending threat to DACA, and what we can do now to defend it - while reminding ourselves that as people of the Christian faith, we have a long line of spiritual ancestors who know what it's like to be "strangers in a strange land." You can sign up for the daily letter here.